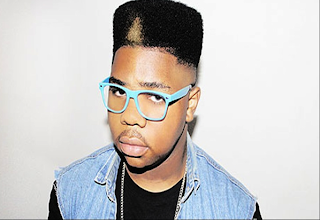 If you don't know about 17 year-old Uzoechi Osisioma Emenike - or MNEK (pronounced Em-En-ee-Kay) - then get to know. As well as a solo artist in his own right, he's crafted tracks for the likes of The Wanted and The Saturdays, the latter resulting in a Top 3 hit for the girl group and remixed tracks from Frankmusik and Tinie Tempah. Yes, you read right - he's 17! The son of a Scotland Yard detective and a professional cake baker, and the brother of upcoming rhymer Bartoven, this incredibly interesting, insanely talented teen released his solo single 'If Truth Be Told' on Moshi Moshi last November. We caught up with the fast-rising south London singer/ songwriter/ producer and remixer to find out his Top 3 Tips for 2012. The best song I've written to date is.... Yet to be written! My favourite artists in the world are... Mariah Carey, Frankmusik, Black Box, FREEEZ, and Ryan Leslie..
A*M*E: 17 year-old pop star signed to Gary Barlow's label. I wrote and produced her upcoming single 'City Lights'. Bartoven: My brother! A big talent, features on 'City Lights', and making a mark in the UK rap game. Vida: Oritse Williams from JLS' girlgroup. Mega-talented quartet, I've been working with them and they are set to take the nation by storm-uhhhhhhh! !